Please note that the content of this book primarily consists of articles available from Wikipedia or other free sources online. 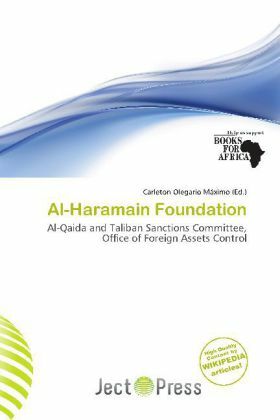 Al-Haramain Islamic Foundation was a charity foundation, based in Saudi Arabia, alleged by the U.S. Department of the Treasury in a September 2004 press release to have "direct links" with Osama bin Laden. The charity is now banned worldwide by United Nations Security Council Committee 1267. The Office of Foreign Assets Control of the United States Department of the Treasury had already banned various branches of this organization at various times, including the US branch on 9 September 2004. Under various names it had branches in Afghanistan, Albania, Bangladesh, Bosnia, Comoros, Ethiopia, Indonesia, Kenya, the Netherlands, Nigeria, Pakistan, Somalia, Tanzania, and the United States.